The Scoop: Although moving on after you’ve lost someone you love can be difficult, over time you can find ways to, as Paul McCartney said, “take a sad song and make it better.” WidowsOrWidowers.com can help bereaved singles take important steps to heal their hearts and rediscover joy in their lives. This niche dating site has been a much-needed light for widows and widowers experiencing dark days. Its online search and matching tools have connected thousands of singles across the nation and given them a place where they can discuss their grief without fear of judgment. Founded in 2004 by a widow in the UK, WidowsOrWidowers.com has become a trustworthy and authoritative resource where grieving singles can find answers, advice, and a second shot at love. Comedian Patton Oswalt lost his wife Michelle McNamara in April 2016. They’d been happily married for 10 years. He has talked publicly about his grief, calling it more of a “numb slog” than a “healing journey,” and his experiences raising his 7-year-old daughter Alice without his wife. Patton has used his talents as a comedian to work through his frustrations and pain with his characteristic biting sense of humor. He has been so candid about his grieving process that some of his fans were surprised to hear of his recent remarriage to Meredith Salenger. 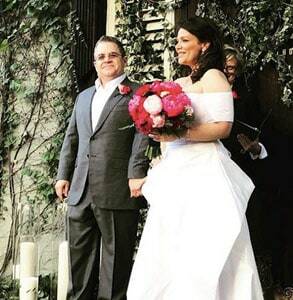 Patton Oswalt remarried in 2017, 18 months after his first wife’s passing. Meredith had reached out to the recently widowed actor on Facebook, and they’d fallen for one another very quickly. They tied the knot in November 2017, about 18 months after Michelle’s death. Patton’s re-marriage sparked a debate about life after grief. How long should a widow or widower wait before committing to another partner? How do you introduce a new person into a healing family? What is the right path forward? Well, that’s up to you, but one niche dating site called WidowsOrWidowers.com aims to provide thoughtful guidance and insights from people who have gone through similar experiences. Founded in 2004, WidowsOrWidowers.com is the longest-running dating site designed exclusively for widows and widowers in the US. Annie Hunte originally launched the site in the UK after she lost her husband and realized how difficult it was to meet single men who understood what she was going through. She established a compassionate network to support bereaved singles going through unthinkable pain and heartache. Today, WidowsOrWidowers.com has sister sites in the UK, Australia, Canada, Ireland, New Zealand, and South Africa. Singles around the world have used this platform to talk about their grief and find a path forward with the help of people who can offer empathy, support, friendship, and even a second chance at love. WidowsOrWidowers.com has steadily grown in the US, and it is particularly popular in large metropolitan areas in New York, California, Florida, and Pennsylvania. This free, family-run dating site gives a voice to widows and widowers across the country. Annie and her son Edward have worked hard to understand the needs of American widows and widowers and provide a place where they feel welcomed and safe. The WidowsOrWidowers Dating Advice section covers many different dating topics from the perspective of a widow or widower. The blog posts discuss everything from how to tell if someone’s interested to how to introduce a date to children. These are important and sensitive issues, and the writers take a thorough and thoughtful approach to advising singles on how best to proceed. Thousands of people have signed up to WidowsOrWidowers.com looking for a fresh start. The online community offers a safe, nonjudgmental place for singles who have loved and lost and now feel ready to think about dating someone new. Some users are still raw from a recent death while others have spent decades alone and yearn to have someone in their life again. WidowsOrWidowers.com respects the emotional journey of every individual on the site and offers reliable resources and tools to help them along the way. Whether the dating site is recommending potential matches or highlighting a self-help book written by a widow, WidowsOrWidowers.com focuses on positive solutions to heartache. WidowsOrWidowers.com offers invaluable support to widows and widowers in the US and abroad. The dating site’s advice articles and inspiring stories can validate the experiences and emotions of singles who may feel guilty or worried about moving on. Maybe they’ve never tried online dating, or they’re concerned how their in-laws will react. WidowsOrWidowers.com addresses these and other issues with a down-to-earth and optimistic tone. After the announcement of his 2017 engagement, Patton pushed back against criticism that this second marriage came too soon after his wife’s passing. He tweeted that he doesn’t care what the “bitter grub worms” say — he has found a way to be happy again in a new life, and that’s all that matters to him. WidowsOrWidowers.com exists to help other singles find the courage and strength to move forward with their lives and find love after grief. Everyone’s journey is different, and it’s never going to be easy, but the dating site offers plenty of resources and support systems to help people through the healing process.